« best picturebooks of 2017. and also podcasts. Welcome to my first seasonal plan! I am conveniently skipping over December, you see, since it is the past. Thinking back, I don’t know how I could have worked out any sort of goals last month except Feed Family, Acquire Gifts, and Survive Travel. Anyway, I am in the present now, as are you, I assume. It’s the end of January, actually, and I’m looking toward the near future. 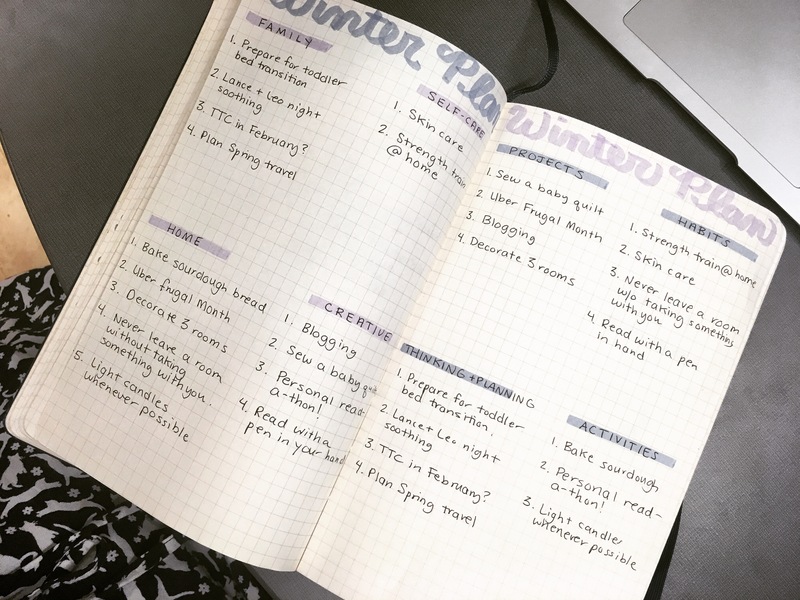 When I started to narrow down my goals and plans for the quarter, I wasn’t quite sure if it was better to think about my goals in terms of topic or in terms of strategy. I ended up doing both. Dividing my list by topic – family, home, creativity, and (gag) self-care – helped my list feel balanced. Dividing by strategy ensured I wasn’t trying to change one million habits at once (you win, Babatua) or taking on too many big projects. I divided my plan into four strategic categories: habits, projects, thinking and planning, and activities. As I write, I’m already three weeks into month – just into the second half of the season. So far, I am finding this plan to be a pleasant reference point as I make my various to-do lists, make plans for my free time, and find books to read at the library. I wasn’t getting out to exercise much before the Cold and the Snow arrived (see: toddler + full time job), so it would be entirely foolish to assume I would start getting to the gym with any regularity now. I really hate working out at home, but if I want to exercise at all, I should probably make peace with it. I am hoping to find some sort of strength routine that doesn’t require much equipment – I liked following the New Rules of Lifting program a few years back, so something like that I could do in my living room would be perfect. In the exhausted hubbub of the holidays, I had a moment with the bathroom mirror where I realized that yes, my face is aging. And no, I’m not really doing anything to remedy it. I’m not yet 33, so I’m hoping I have a little time to turn things around. Oh, and perhaps deal with the acne. Acne and wrinkles, guys. This is 32/33. Read with a pen in hand whenever possible. I struggle with finding a balance between reading for pleasure and reading for more professional purposes, but I feel like there’s a simple compromise. Reading anything with a pen in hand encourages writing about what I am reading which encourages thinking about what I am reading. This may prove challenging given my current reading habits – see: standing up on the train, walking in the park, on the couch while a toddler climbs all over me – but I’ll try whenever I can. longer than a task + but shorter than a habit = a project! I have signed up for the Frugalwood’s Uber-frugal month challenge. This involves receiving daily emails about frugality and completing small assignments. I’m halfway through the month, and luckily, most of the assignments are things I already do. “Read an email every day” is a pretty easy project to accomplish! There’s also a “don’t spend money component, but while this is more difficult, it’s not at all time consuming to *not* do something, so that’s convenient. In case you didn’t notice, I am trying to blog slightly more often than… oh… four times a year. Writing, posting, thinking about posts, figuring out when to do all this stuff… well, that’s a project. As I mentioned in my NYR post, I am beautifying my home in 2018. Living room is up first, in January. I’m thinking of doing the office next, since I’d like to… oh… use this room for its intended purpose. Or even just see the top of my desk. Either of those things would be great. I have three friends/family members who are procreating this year, and guess what! I am trying to become an accomplished quiltress. Baby quilts are perfect to practice on, so I am going to sew some. I want to finish the first by April, so now is the time to start planning and working so I’m not trying to scramble at the last minute. Prepare for the transition to a toddler bed. While we were visiting family for Christmas, my eighteen-month-old learned how to climb out of cribs. At first it was just a dinky travel Pack ‘n’ Play – then it was a full-size crib identical to his own. Since we’ve been home, the humble Sleep Sack (thank you, thank you, thank you Halo) has subdued our little monkey, but the experience was enough to put the fear of God into me. It’s only a matter of time before he figures out how to climb in it or, heaven preserve me, unzip the zipper. Game plans, contingencies, and strategies must be made NOW. Prepare for a potential child-free vacation. My darling toddler is a decent sleeper. Unfortunately, he’s not the most *reliable* sleeper – while he’s been sleeping better and better since turning a year old, he’s still prone to periodic sleep setbacks, regressions, etc. Right now, he’s sleeping through the night, with a middle of the night wake-up maybe once a week or so, and it’s that random wake-up I’m concerned about. Because, you see, my darling, decent sleeping toddler accepts no middle-of-the-night comfort except his beloved Mama Milk. And Mama and her Milk would like to take a child-free vacation this Spring. I don’t know if the solution is Official, Once-and-for-all Night Weaning or All the Way Weaning or some intensive Dad’s Nighttime Toddler Soothing Boot Camp or what, but I’d like not to leave my kid overnight with someone knowing he is going to be a middle-of-the-night terror – and that he will be middle-of-the-night terrorized by my absence. I feel like this is uncharacteristically personal for this psuedo-book blog… but I have an 19-month-old, so I feel like having another is not really the world’s most surprising turn of events. I’m almost 33. We are in the desirable window for a 2-3 year sibling age gap. So it’s time to at least think and plan. Oh, and also frantically squirrel away money just in case. As much as I might be fantasizing about another February trip to Mexico, we are not planning any Winter travel this year. Spring, however, is looking more promising. Now is the time to check schedules, request time off, and start looking for flight deals. one-off tasks that either don’t take much effort or can be crossed off in an afternoon. preferably fun! Using and maintaining a sourdough starter was something I pulled off my List of 100 Dreams last Spring… and I’ve kept it alive since then! I wish my track record with house plants was so impressive. Anyway, while I feed my starter lovingly and faithfully, I’ve only baked with it a few times. I’d like to rectify that while it’s still sub-arctic outside and turning on my oven isn’t an offense to my soul. I am officially done with my Book Reviewing Season! I can now read whatever my heart desires… except that sometimes when this happens, I end up reading nothing. However, I’ve found that girding myself from a reading slump can often prevent one, so I’m going to focus on tricking and cajoling myself into keeping the reading momentum going. So far, I’ve indulged in a few Grown Up Books – Little Fires Everywhere by Celeste Ng, I Am, I Am, I Am: Seventeen Brushes with Death by Maggie O’Farrell, List: A Novel by Matthew Roberson – and it really does feel quite indulgent. It’s Winter. It’s cold, I don’t leave the house if I can avoid it, I have stacks of books to read, and I’m trying to improve the ambiance of my home. Prime candle time! Also, a low-ball achievement to check off my list… assuming I can find somewhere to put a candle that my rambunctious toddler can’t access. I love the idea of a super frugal month – will look into that! My daughter was done with her crib at 17 months and the transition was quite easy (surprisingly!). We baby proofed the whole room for peace of mind but she almost always stays in bed, and even though she can open and close doors, she’s never left her room. She has books and a baby doll in there and that’s plenty for her to entertain herself. Oh my gosh, that is the world’s most comforting transition story. Do you have a video monitor? Yep, it’s up on a little corner shelf we mounted close the ceiling so we can see the whole room. Other random details: we put an area rug under her bed to cushion her if she rolled out (which happened twice that we know of) and we picked a toddler bed that’s super low to the ground so she can get in and out independently. Good luck!